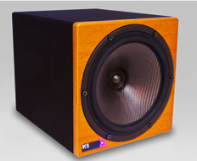 The ultimate studio speakers for the DAW world... the KS Digital C8 Active Studio Nearfield Monitor. The C8 is KS Digital's big brother to the C5, larger in size and broader in sound. This bi-amplified nearfield monitor is a full-range, dynamic powerhouse that features two-way, time aligned performance driven by a 180W bass amplifier and 80W treble amp. With a frequency response of 48 Hz to 28 kHz, this truly is a revolution in "cube" style studio speakers. It can handle any mixing chore, whether as a companion to your main speakers or as your main pair. In today's world of DAW in-the-box mixing, the C8 is the ultimate tool when you need something small with absolute sonic accuracy and full bandwidth, powerful playback. 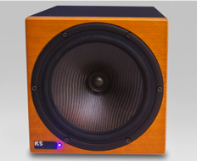 The KS Digital C8 is a self-powered, bi-amplified, full-bandwidth 2-way speaker. Contained inside is a handmade LF carbon fiber waveguide cone within an 8" diameter chassis, with a separately-mounted center HF driver. For precise coaxial performance, these time-aligned center HF/LF drivers mean there are no dispersion anomalies vertically or horizontally, and the C8's optimal impulse response means excellent frequency response and phase coherency. The resulting sound output is sonically neutral, giving you the most accurate full-range presentation you've ever heard from a monitor of this size. Ultra-precise monitoring is matched with incredibly musical reproduction in the C8--it's a speaker that must be heard to be believed. Using it next to your computer monitor is no problem--it includes full magnetic shielding. Portable, perfect for meter bridges, video editing suites, DAW workstations--the KS Digital C8 fits any situation. The fast-acting MOSFET power amp is mounted on the back of the speaker, as well as an XLR input, volume control, bass level control, high frequency level control, low frequency bass ports, IEC power, and on/off switch. Add our ADM B2 or ADM B3 powered subwoofer for even more low end, and if you need the amplifiers separate from the cabinet, we provide C8 units with separate components. The ultimate cube speaker has been realized in the C8; mix on a pair today and you'll hear why. As with all our nearfield studio speakers, the KS Digital C8 is hand-built in Germany for you and is delivered with a signed Certificate of Authenticity, as well as a full 2-year warranty. … Although you can use the C8/C88 very well in a near-field situation, they can also be applied in mid-field applications or even used in larger rooms as the main studio monitors. … In the mid- and high-frequency range, you have a very detailed sound image, which at the same time appears absolutely natural. 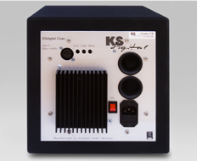 … The complete KS Digital C Series (Coaxial C5, C55, C8, C88) covers all desires for near-field applications. If you’re looking for new near-field monitors, you should not overlook KS Digital! Dimensions H 30 x W 24 x D 24 cm, 12" x 9.5" x 9.5"